Posted by flashlightblog in Interviews, Play, Upcoming Books. The Busy Life of Ernestine Buckmeister, available for the first time this week, is a great new children’s book about children’s play. Ernestine is scheduled to the max, and she’s not enjoying her life that much. After seeing her next-door neighbor, Hugo, play with abandon in his yard every day, she decides to blow off some of her activities in favor of play. So, she goes to the local park with her nanny, and she plays with Hugo, too. As I’ve written recently, I’m very concerned about the widespread censorship of play in books, TV shows, and movies aimed at young kids (9 and below). Ernestine is one of my favorite new books in this genre. Here I present a fascinating interview with the author, Linda Lodding. She provides some great insights into the backstory of the book, as well as how it might contribute to the play movement. Q: On your web site you note that you didn’t play a lot during your childhood. Why do you consider play so important now that you would write a children’s book encouraging play? I don’t remember a play-filled childhood in the sense of spending carefree days outside in nature. Thinking back as to why that might have been, I can point to two reasons. Firstly, since my parents grew-up in the New York City, I don’t think they knew how to offer a nature-filled childhood to my sister and me. Secondly, when I was about five, we moved to a house in the wilds of New Jersey, surrounded by dense forest, situated on what was once an Indian reservation. The woods seemed frightening. Grizzly things with fangs, and child-eating witches with gnarly fingers lived in the woods! And, of course, so did the tomahawk-wielding Indians whose land we were living upon. My mother tried to coax me outside to play, (she even took her ironing board outside so that she could iron while I was outside) but I was happier inside with my Barbies. But I did do a lot of imaginative “pretend” play – alone and with friends. I never set out to write a book encouraging play per se, but was inspired by my own family’s ludicrously funny situation. Like many parents, I set out to enroll my child in as many classes as possible so that she’d quickly find her passion and excel. Of course my daughter’s schedule wasn’t nearly as exaggerated as poor Ernestine’s, but she was falling asleep in her “Ballet for Tots” class and had little energy for her African drumming class. But I also recognized that play time was fundamental to her growth and we eventually pulled back on activities. Q: In a previous conversation you told me that you added the nanny character in a later revision. What did you have Ernestine doing alone before you added the nanny? How do you think the nanny changes the central message of the story? Like all books, The Busy Life of Ernestine Buckmeister went through many revisions. In earlier drafts of the book, I had Ernestine running away after school — breaking free from the demands of her after-school schedule to experience play. There was a lot of interest in the book from large publishing houses, but a few editors were concerned that this scene could be perceived as reckless. It’s every parent’s nightmare to lose their child and a few editors were concerned that Ernestine’s actions would alarm to parents. So, I later introduced the character of Nanny O’Dear to allay any potential unease with Ernestine being alone. The added bonus of having Nanny in the book is that she is also a play companion for Ernestine – together they share the joy of play. There’s a lot to be said for adults also participating in play. I don’t think adding Nanny changed the central message of the story which is, ultimately, to let children experience the joy of play. Q: Why are there so few children’s books depicting children playing outside? Why are there practically none that depict children playing with no adults directly supervising them? There are books depicting children playing outside, but it’s hard to think of contemporary picture books where children are depicted as playing outside unsupervised. I think this is a direct result of societal fears for our children’s safety. We are bombarded with stories of pedophiles and missing children and these stories send us a chilling reminder that we must be vigilant for our child’s safety or else…As a parent, I can appreciate that it’s a thin line to walk between protecting our children from genuine threats and giving them challenging opportunities in which to learn and grow. I’m aware, however, of our need to bring in some common sense into this dialogue and blogs and organizations such as yours, 50 Dangerous Things, Re-Thinking Childhood and Free-Range Kids are asking parents to question if our eagerness to be over-protective is detrimental to our children’s maturation process. My focus in The Busy Life of Ernestine Buckmeister was on allowing children to experience unstructured play, whether supervised or not. But back to your question. While I’m not an editor and don’t make acquisition decisions for publishing houses, my take on the reluctance of depicting unsupervised play in picture books is that since adults are the primary picture book buyers, children’s book publishers are leery of putting stories out there where the child could be perceived as being in danger and thereby alienating book buyers. Naturally, publishing is a business and in order to protect their investment in a book, publishers need to make sure that the book will have a wide-enough appeal. Interestingly, in older fiction (Easy Readers, Middle Grade and beyond) you can find an abundance of stories where children are playing and exploring unsupervised. I do think that children are drawn to stories where the protagonist is given freedoms that today’s children don’t generally experience — characters that are orphans, or are somehow left to fend for themselves in an adult world. One of my favorites growing up was From the Mixed-up Files of Mrs. Basil E. Frankweiler, where a brother and sisters run away to the Metropolitan Museum of Art. This wouldn’t be the same story if their mother was in tow. And I do think that the hugely popular Magic Treehouse series partially owes it’s kid-appeal to the fact that the kids are on their own solving mysteries. Perhaps this is a way for children to experience freedoms that they haven’t been allowed. But in picture books, you won’t see this kind of characterization – unless they’re talking animals. Pigs and rabbits are allowed to take some risks! Q: You told me that you weren’t very aware of the play movement before you wrote this book. How do you think that it can contribute to the play movement? While I was aware of the over-scheduled child phenomenon, I was less aware of the pro-play movement. It wasn’t until The Busy Life of Ernestine Buckmeister was accepted for publication, nearly two years ago, that I started to research the benefits of play. Articles such as “The Virtues of Play” (Wired Science) and “Want your kids to get into college? Let them play!” (CNN) dramatically focus the debate not only for parents but also for students, academicians, and policy experts. Research shows that children can greatly benefit from unstructured playtime — imagination flourishes, emotional maturity develops, and certain life skills are honed. I learned that play is essential to physical, intellectual and social development and contributes to healthier and happier children. The bottom line is that children who play do better in school and are more likely to become successful adults. The irony is, if our child could take a class that guaranteed that sort of outcome, I think we’d all enroll our kids immediately! While there are many wonderful organizations that are crusading to put play back into children’s lives and recess back into schools, I’ve yet to come across a picture book that squarely addresses this issue. Hopefully, through the book’s humor, parents will be able to see the light-hearted side of this subject and, if they aren’t already doing so, just may decide to get their kids playing. If my book gets kids and parents laughing and playing, then maybe I can make a small contribution to this important movement. Q: Let’s say a real-life Ernestine reads this book. Ideally, how would she react? Ernestine is an exaggerated character, but I don’t think she’s too far off from what some children experience. There are many children who cope beautifully with full-schedules and those kids probably won’t recognize themselves in Ernestine but will enjoy the book on another level. But I also think there are many Ernsts and Ernestines out there who are wishing for time to just be — not to perform, to train, to compete — but just to play. And those young readers may feel sympathetic to Ernestine. If the book starts a family dialogue then that’s a great bonus. But as a writer, my aim is also to entertain and tell a fun story. Posted by flashlightblog in Dragon, Imagination, Interviews, Summer. 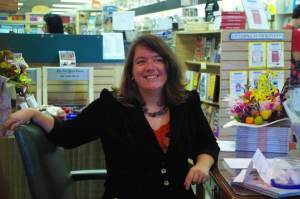 Jodi Moore, author of When a Dragon Moves In (Flashlight Press 2011, illustrated by Howard McWilliam), talks about her first picture book in an interview on WHVL TV, State College, PA. It aired April 2011. Posted by flashlightblog in Bullying, Interviews, Values. Yes. Janice Levy, author of Alley Oops, is interviewed on online radio and talks about bullying.